Technology Instructions for Steinman 210. If you experience any problems, call ext. 3333 or e-mail the Help Desk at mediaservices@etown.edu. Please visit our Web site at http://www.etown.edu/ITS for additional information. Note: Point the remote control at the projector to turn it on. All remotes should be found on the table. You can use the projector remote to control the volume in the room. Step 1: Press the Power (red) button on the projector remote to turn on the projector. Step 2:Press the Power button located on the back of the Macintosh computer if not already on. Log on with your network username and password. If you are a guest, please contact the department assistant for a username and password. Step 3:Press Input Select on the projector remote and the computer image will appear on the projection screen. Step 1:Begin with the laptop turned off to connect. 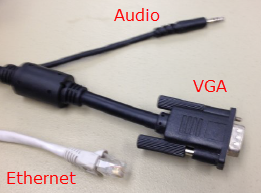 Step 2:Connect the VGA cable to the blue port and Ethernet cable to the network jack on your laptop. 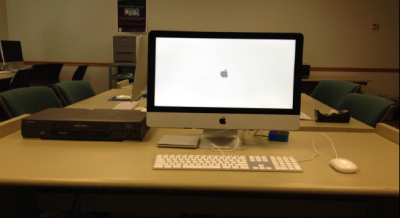 The cables are located behind the Macintosh computer. Step 3:Press the Power button on the projector remote to turn on the projector. Note: Wait a few minutes for the projector to warm up. Step 4:Press Auto Setup on the projector remote until the laptop is connected. Step 5:Turn on the laptop. If you need power, plug in your power adapter into a power outlet in the room. Step 1:Press the Power button on the projector remote to turn on the projector. Step 2:Press the Power button on the black VCR player to turn it on. Step 3:There is no VCR remote for this room. You will need to use the player to control it. Step 4:Press the Input Select button on the projector remote to cycle to the correct input for the VCR. Step 5:A DVD can be played through the Macintosh computer. The portable drive is located next to the monitor of the computer. Step 1:Log off or shut down the computer by clicking the Apple icon in the top left corner of the screen. Step 2:Turn off the projector by clicking the Power button on the projector remote twice. You will be prompted by a message on the projection screen. Step 3:If you want to turn on the projector again, give the machine several minutes to cool down before starting up again.